Here are the winning results in the Barenreiter competition. All you had to do was pick your favourite one & say why you liked it. Thank you everyone who took part, and congratulations to all the winners. They will be contacted shortly. Although most of the winners voted for Mozart, the most popular composer was actually Brahms! 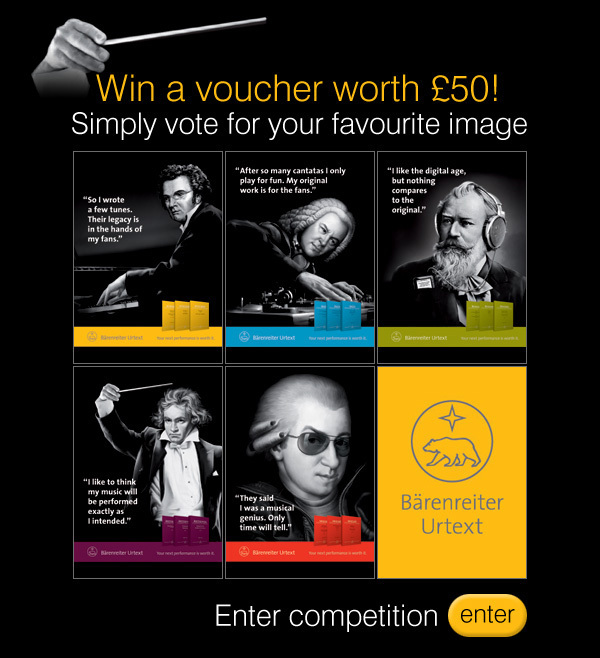 You can buy postcards, magnets and pencils featuring the Barenreiter images from our website – just click on the image above. In case you are wondering how we decided the winning answers, we asked 4 members of staff at Ackerman Music and also Barenreiter to list their favourites. We compiled these together to come up with the results. Enter our competition. We have 5 prizes to give away, with the top one being £50. Click anywhere on the image to go to our competition page.